Pear-caramel and pistachio-cream filled chocolates made by yours truly. My last two weeks were spent producing chocolate candies (by hand!). It was one of the messier classes in the program... for those two weeks, doing laundry seemed to be a daily affair. And although I won't be a chocolatier anytime soon, I did learn some cool methods — chocolate tempering (by hand! 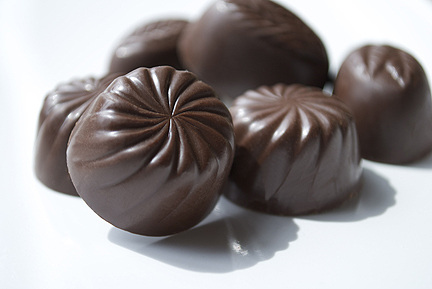 ), enrobing, hand-dipping and casting chocolate in molds for filled candies. Hey, and get this — I'm currently in my 10th week of school with just 14 more weeks to go!